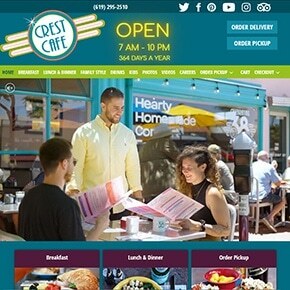 The Crest Cafe is a popular diner which has served the Hillcrest neighborhood for over 35 years. When I redesigned the site in 2010, I was inspired by the neon on their facade and the colors of the Fiestaware used by the restaurant. The site was also one of of the first I built with a “responsive” design. The site has an interactive menu, galleries of their photos and embedded videos of some of the TV spots they’ve filmed.